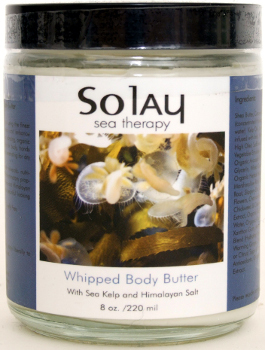 Solay Sea Therapy Whipped Body Butter is blended by hand using the finest ingredients to enrich and enhance your skin with a hydrating and organic treatment. It is great for the body, hands and feet and deep penetrating for the dry skin. It is a natural bath and body product that combines the minerals, nutrients and anti-inflammatory properties of Sea Kelp and Himalayan Salt to give you beautiful looking skin.